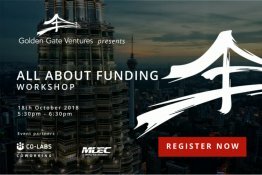 Golden Gate Ventures together with MDEC is hosting an All About Funding workshop led by Jeff Chua and Angela Toy from Golden Gate Ventures. This workshop will cover what companies/founders should look at when fundraising and how to prepare for fundraising and key terms of a VC investment. This is an invite-only session, with limited seating capacity. Golden Gate Ventures together with MDEC is hosting an All About Funding workshop led by Jeff Chua and Angela Toy from Golden Gate Ventures. This workshop will cover what companies/founders should look at when fundraising and how to prepare for fundraising and key terms of a VC investment. This is an invite-only session, with limited seating capacity. We appreciate your RSVP to register your interest by 16th Oct 2018. Golden Gate Ventures (GGV is an early-stage venture capital firm investing across Southeast Asia. Since 2011, the firm has invested in over 30 companies across more than 7 countries in Asia. The firm invests in internet & mobile startups across many sectors, including e-commerce, payments, marketplaces, mobile applications, and SaaS platforms. Food and drinks will be provided from 6:30pm onwards.